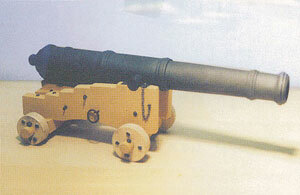 The smallest gun of the main armament, this weapon was mainly used on smaller ships such as frigates and brigs. Much lighter than its larger brethren, it needed a smaller crew and could fire at a far quicker rate. The gun carriage is well detailed.